“Touch Not my Anointed Ones:” What Does it Really Mean? “Touch not my anointed ones, do my prophets no harm.” This verse is found in two books of the Bible namely 1 Chronicles 16:22 and Psalm 105:15. In fact, part of Psalm 105 is a repetition of the song of David in which these words were said in 1 Chronicles 16:8-36. I would contend that this is one of verses that is often prone to abuse. I have heard different people, more especially those who claim to be special “men and women of God” and their followers respectively, using this verse to challenge or even scare those who rebuke or points out errors, heresies, or sin in the lives of these “men and women of God.” But if we interpret the verse in its context would we arrive at the implication that “men and women of God” should not be rebuked for any error or heresy or sin? This is the question I am endeavoring to answer in this post. Understanding any passage of the Bible in its appropriate context is the first and very crucial step in the art and science of interpreting and applying Scripture. Disregard of context in which any passage of Scripture was given leads to all sorts of errors in interpreting and applying biblical truths to our present situation. Thus we should begin with context. What is the context in which these words, “Touch not my anointed ones, do my prophets no harm” were said. As already pointed out, we first encounter these words in 1 Chronicles 16:22. They are part of a song of thanksgiving that David together with Asaph and his brothers sang after they brought the Ark of the Covenant into Jerusalem. For some time, the Ark of the Covenant was outside Jerusalem. But, when David became King of Israel, he together with the elders of Jerusalem agreed to bring the ark to the headquarters of the kingdom of Israel, Jerusalem. The first time they attempted to do this, they did not follow God’s prescribed procedures of carrying the ark hence Uzzah was killed and the ark was abandoned at the house of Obededom (1 Chronicles 13:1-14). However, on the second occasion, David and Israelites followed God’s instructions and they successfully brought it into Jerusalem. This is the context in which this verse is to be interpreted and applied. Some have argued that since the anointed office in Israel was that of the king, the phrase “my anointed ones” refers to kings of Israel. However, by this time, Israel had no kings. Unless, we interpret it to mean that God was speaking in reference to future kings then this interpretation undoubtedly holds water. However, I share with John Calvin’s interpretation in which he says that “my anointed” ones or “my prophets” refer to Israel’s patriarchs since one of the patriarchs, Abraham, is also called a prophet in Genesis 20:7. Having discovered out who “anointed ones” are in the passage, we need next to figure out the meaning of “touch not.” One major characteristic of Hebrew poetry or songs is parallelism in which the truth of the first line is repeated in the second line but not with the exact same words. This is the instance here. In other words, David could have easily said: “Touch not my anointed ones, touch not my anointed ones.” This would seem unnecessary repetition. For that reason, Hebrew poetry or songs employed parallelism to say the same truth in different words. Hence “touch not” is the same as “do no harm” and the referent of “my anointed ones” is the same as that of “my prophets” namely the patriarchs of Israel or the Israelites who sojourned from Egypt on the way to Canaan. Therefore, if we are to interpret the verse in its own context, it would mean that God commanded the nations and kingdoms that Israelites were passing through from Egypt to Canaan not to harm them physically but to let them pass through freely and peacefully. Application of the verse includes the truth that God protects and guards his chosen people or servants. This is what we need to draw from the verse. Furthermore, from this verse we can deduce that God prohibits any type of physical harm not only to his chosen people but to all people as the Sixth Commandment (Thou shall not kill) and Genesis 9:5, 6 confirm. So, “Touch not my anointed ones” has to do with prohibition of physical harm and not rebuke of error, heresy or sin. Nowhere in the Bible has God commanded that we do not rebuke his people or servants. Instead, the Bible encourages us to rebuke error, heresy or sin in love and truth. God used his prophets in the Old Testament to rebuke sin or error or falsehood in the lives of kings and false prophets (2 Samuel 12:1-15; 1 Kings 18:17, 18; 2 Chronicles 16:7-10; Jeremiah 23; Ezekiel 11:16-21). In the New Testament, Apostle Paul rebuked his fellow Apostle Peter of hypocrisy (Galatians 2:11-14). The Scripture itself tells us that God has given us his word for among other things to rebuke error, heresy or sin: “All Scripture is breathed out by God and profitable for teaching, for reproof (rebuke), for correction, and for training in righteousness, that the man of God may be competent, equipped for every good work,” (2 Timothy 3:16, 17, italics mine). Have you ever read a story in the Bible and felt like God acted ‘unfairly’? I have. One such story is that of Uzzah recorded 1 Chronicles 13:1-14. David together with the leaders of Israel decided to bring back to Jerusalem the Ark of the Covenant which represented the presence of God among Israelites. For some time the ark had been kept by Abinadab outside of Jerusalem. 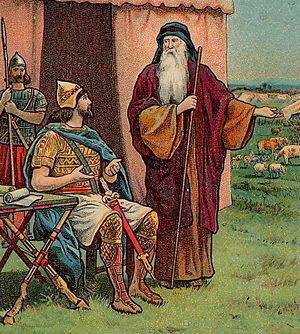 David with leaders of Israel carried the ark in a cart which was being driven by Uzzah. On the way to Jerusalem, the oxen pulling the cart stumbled and the ark was about to fall. Uzzah stretched out his hand to protect it from hitting the ground. Immediately he touched the ark, God struck Uzzah dead. Was this fair? I thought Uzzah was doing a very good job of protecting the ark? Why did God struck him dead? The answer: according to God’s instructions regarding the ark, Uzzah was not supposed to touch it. Besides, the ark was not supposed to be transferred on a cart but on shoulders of priests called Kohathites (Numbers 4:1-20). So, to put it simply: God acted justly not unfairly. What we learn from the story is that we should take God’s Word seriously and always act accordingly. God is never pleased when we ignore His word and do things in our own way. No matter the reason or the motive, we can never justify disobedience to God’s Word with anything. Uzzah was not supposed to touch the ark. He was not supposed to carry the ark. He disobeyed these instructions from God and no matter how hard he could justify his actions the truth of the matter was that Uzzah disobeyed God’s Word. Similarly for us today, we have no reason to disobey God’s Word and justify our disbedience with phrases like “God is love” or “God is merciful” or “God is full of grace” or “things have changed” or “that was Paul” Never! Never! We either obey God’s Word or disobey it. No middle ground. Yet unlike the case of Uzzah, we still have a chance of repenting if we realize that we have been living in disobedience to God’s Word. Scripture reminds us: “If we say we have no sin, we deceive ourselves, and the truth is not us. If we confess our sins, he (Jesus) is faithful and just to forgive our sins and to cleanse us from all unrighteousness,” (1 John 1:8, 9). May His grace enable us to walk in obedience to His Word always. It’s the last part that has inspired this article. People never crumble in a day. There are so many examples that you and I can cite to uphold this statement, but I would like us to turn to Scripture and look at the life of the first king of Israel, Saul. He, too, never crumbled in a day. It was a slow fade. After being king over Israel for some years, God had this to say about King Saul: “I regret that I have made Saul king, for he has turned back from following me and has not performed my commandments,” (1 Samuel 15:10). Later on Samuel blatantly tells King Saul, “Because you have rejected the word of the LORD, the LORD has also rejected you from being king” (1 Samuel 15:23). The story that began so well is ending on a sad note. Earlier on when the LORD directed Samuel to anoint Saul as king, Samuel said these words to the people of Israel: “Do you see him whom the LORD has chosen? There is none like him among all the people.” And all the people shouted, “Long live the king!” (1 Samuel 10:24). But after some time, the same Samuel tells Saul that God has rejected him as king. Now, we might wonder as to what happened for the Lord to completely reject Saul as king but if we take a detailed look at his life we will find evidence of ‘slow fade’ in the life of Saul. He who begun so well by trusting the Lord, ended up doing things in his own way and breaking the heart of God in the process. Disobedience, jealousy, murder and idolatry slowly faded away the trust and faith that Saul had in the LORD earlier. First was the disobedience to the word of God through prophet Samuel who told Saul to go to Gilgal and wait for seven days before Samuel could come to offer burnt offering (1 Samuel 10:8). However, Saul out of panic as the Philistine army approached him, failed to obey the word of God and offered the sacrifice himself instead of waiting for Samuel. Remember that only Samuel was supposed to offer the burnt offering. Samuel rebuked him for this ‘foolish act” (1 Samuel 13:12) and he told Saul that because he disobeyed the commandment of God, the Lord will not establish Saul’s kingdom over Israel forever (1 Samuel 13, 14). I was expecting to read of Saul’s repentance in the proceeding verses but there was no such thing. No remorse, no repentance from Saul. When asked why he defied the Lord’s command Saul shamelessly replied that he spared the best sheep and oxen to sacrifice them to the Lord. Samuel response to this lame excuse was very outstanding: “Does the LORD delight in burnt offerings and sacrifices as much as in obeying the voice of the LORD? To obey is better than sacrifice, to heed is better than the fat of rams” (1 Samuel 1:22). The truth of our vulnerability without Christ should continually be borne in our minds hence we should continually lean on Jesus and completely refuse to be deceived by our wicked hearts that we are strong without Christ. The word of God is very lucid on this: “Therefore let anyone who thinks that he stands take heed lest he fall,” (1 Corinthians 10:12). We can’t stand without Christ otherwise we will surely crumble although it might not be in a day.